“I don’t know” are three words that most people dread saying. The need to know the answer has followed us from school into the working world. We are loath to admit ignorance. I have seen colleagues twist themselves into a pretzel inventing an answer. The company, and you personally, may be exposed to undesired risks. 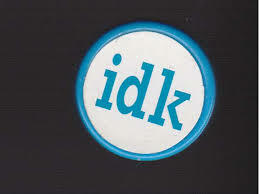 Some advise against saying “I don’t know” because it may be seen as a sign of weakness. Clarifying the question, answering what you can, and using more oblique phrases are acceptable options. In my experience, admitting you don’t know is often the best option. Ensure your data foots and all calculations are correct. Nothing derails a meeting faster than bad math. When you do not know the answer, do not try to figure it out on the fly—it rarely goes well. Few of us are talented enough to analyze data and facilitate a meeting at the same time. It is been better to do the analysis after the meeting and follow up. I had a colleague who conducted our division’s monthly financial review live. She brought his laptop and a projector to the leadership meeting, and conducted on-the-spot analytics. Sometimes, it felt like the executive asked difficult questions just to test her proficiency. The solution may be suboptimal. It may not follow a prescribed design pattern or it may foretell a future problem. Most companies have well documented policies and standards governing business and management practices. These documents are carefully crafted to protect the company from risk. I have found that corporate governance organizations (e.g., Legal, HR, Procurement, etc.) prefer providing guidance up-front rather than dealing with a problem later. Being forthright about the limitation of your knowledge. Similar to the other scenarios, it is best defer answering than give a wrong answer. Wrong answers can lead the person astray, result in an unintended consequence, and/or impact your credibility. The project is not going well, what will leadership do? What is impact to our group of the latest reorganization? What will happen now that our company has been acquired? If you are in a leadership role, it is imperative that you demonstrate constructive behaviors. Motivate yourself and your team to stay focused. If changes in strategy and tactics are needed, then embrace the new direction. Being comfortable admitting that you “don’t know” is liberating and empowering. Actively soliciting input from others and creating an environment where thoughtful disucssions are encouraged leads to better decisions and outcomes. Activities like the NASA moon landing game are great team building games that demonstrate the collective wisdom of the group. © 2017, Alan Zucker; Project Management Essentials, LLC.